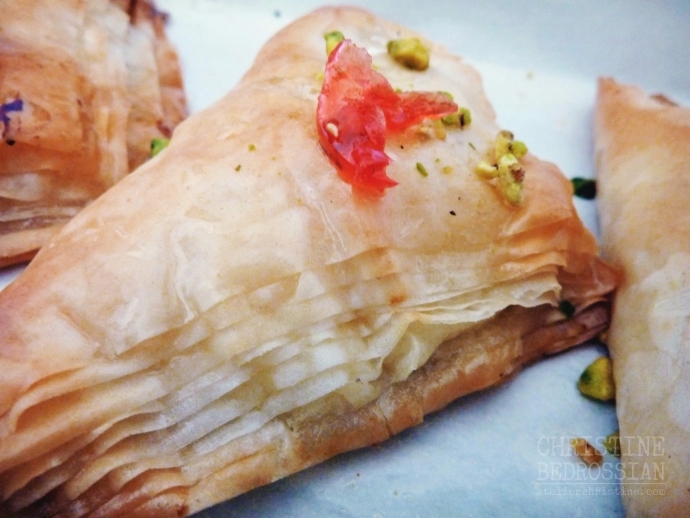 Warbat bil Ashta is a Middle Eastern pastry made with thin layers of phyllo dough wrapped around creamy custard, similar to clotted cream, and drizzled with simple sugar syrup. Make the cream custard a day in advance and refrigerate until set. Make the simple sugar syrup and allow it to cool to room temperature before use. Using shortcuts and thickening agents is a common practice among home cooks to save time and create what is called ‘Homestyle Ashta’, a mock clotted cream. Fresh breadcrumbs or coarse semolina is added to the cream to create texture and cornstarch to speed up the process of turning milk into custard. Middle Eastern clotted cream, Ashta, is traditionally made with unpasteurized water buffalo milk because of its high fat content. Nowadays, a mixture of half cow milk and half sheep milk is used. Sheep milk, used to make cheese (Ricotta, Feta, Pecorino Romano, Roquefort) and yoghurt, has one-and-a-half times the fat content of cow milk. For the home cook, a combination of liquid heavy cream and sheep milk (if available) will create that authentic taste; otherwise use cow milk or just heavy cream, or heavy cream combined with half & half. To make authentic clotted cream, add 4 cups cream/milk into a heavy-bottomed saucepan and gently boil for 10-to-20 minutes. Fill a small saucepan with water, 2-inches less from the top, and bring to a gentle boil. Pour cream/milk mixture into a square glass dish and place over the saucepan filled with water, making sure water does not touch the glass dish. Let cream cook for about 30 minutes then reduce heat and bring water to a gentle simmer. Keep it on the flame until the cream/milk mixture is increased and rises up by about half-an inch; this will take anywhere from 2-to-8 hours (depends on your liquid’s fat content) – meanwhile, every now and then, use a ladle to lift cream and drop back from height into dish in a steady slow stream; this will create bubbles. *** Alternatively, cover dish containing cream with aluminum foil and place in a preheated 185F-to-200F oven for 10-to-12 hours. Once cooked, cover cream with parchment paper touching surface. Cool to room temperature then refrigerate for at least 24 hours; preferably 2 days – eventually the butterfat will cling together to form crystals and the cream will thicken. Once set, skim off the clotted top cream layer into a bowl – this leaves you with a layer of liquid cream at the bottom which can be used as half-and-half. 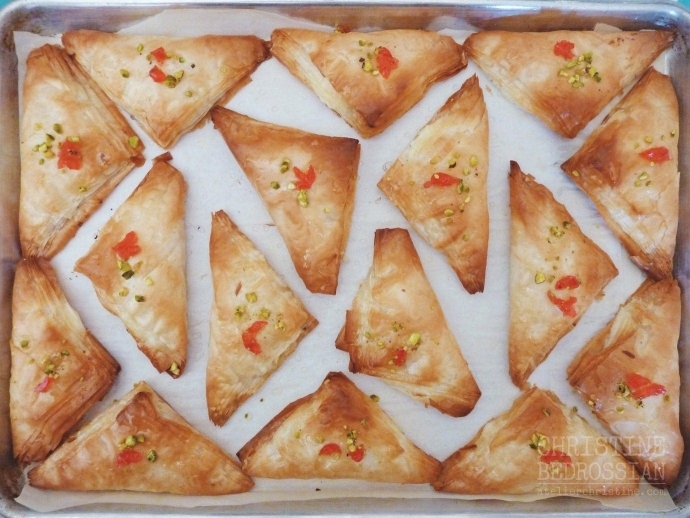 Warbat (shaabiyat) is traditionally garnished with ground pistachios and red candied orange blossom jam (zahr el laymoun) which can be found in Arabic pastry shops. Prepare clotted cream custard. Into a heavy-bottomed saucepan add 3 cups milk, heavy cream, mastic and sugar. Bring to a gentle simmer and cook until sugar crystals dissolve. Slowly add semolina as you stir with a spoon. In a small bowl whisk together 1/3 cup milk and cornstarch until smooth. Mix into hot cream as you whisk. Cook on medium-low heat, stirring continuously, until custard is hot, thickened and bubble craters start to form on top. Remove from heat and mix in both orange blossom and rose waters. Transfer cooked cream custard into a bowl and cool, uncovered, for about an hour – give it a gentle stir every 15 minutes. Cover with plastic wrap touching surface and refrigerate until set. Prepare simple sugar syrup. Combine water, sugar and lemon juice and cook on medium heat, unstirred, until sugar almost dissolves. Stir by swirling pan, bring to a boil, swirl pan once more and simmer (gentle bubbles) 9-to-15 minutes until liquid turns into syrup. Cover pan with lid during the last one or two minutes of cook time – this allows steam to dissolve sugar crystals stuck to sides of pan. Add orange blossom water and cold butter cubes and gently stir until thoroughly incorporated. Set aside to cool to room temperature. Assemble dessert. 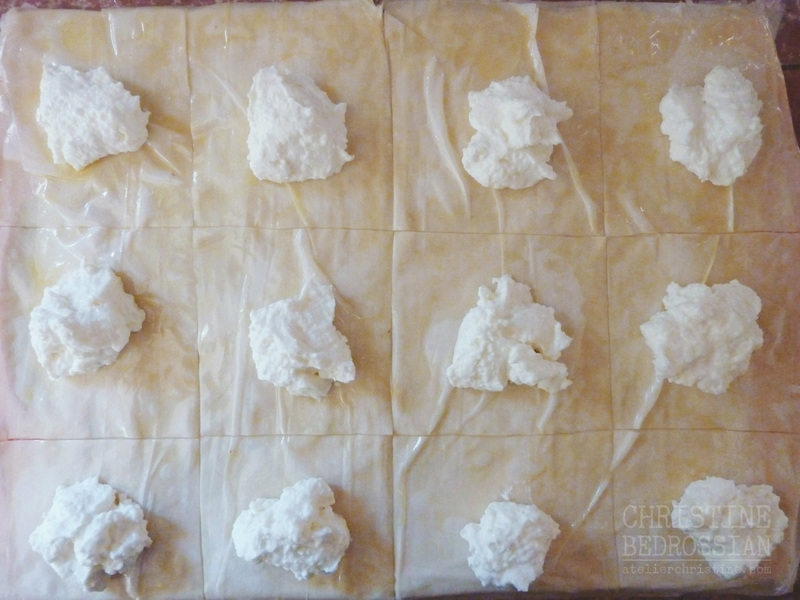 On a clean working surface, stack 10 sheets of phyllo dough on top of each other brushing each layer with a mixture of half butter and half oil. Cut stacked sheets into 12 squares. Place about a tablespoon of clotted cream onto each square and fold dough over forming a triangle. Transfer assembled pastries onto a greased pan and brush tops with butter/oil. Bake in a preheated 400F oven for 6 minutes then reduce temperature to 375F. Brush tops once more with butter/oil and bake for another 5-8 minutes until golden. 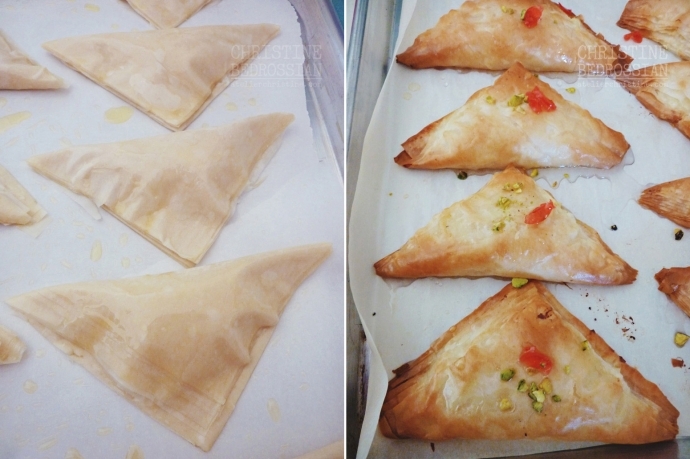 Remove from oven and immediately drizzle with simple sugar syrup. 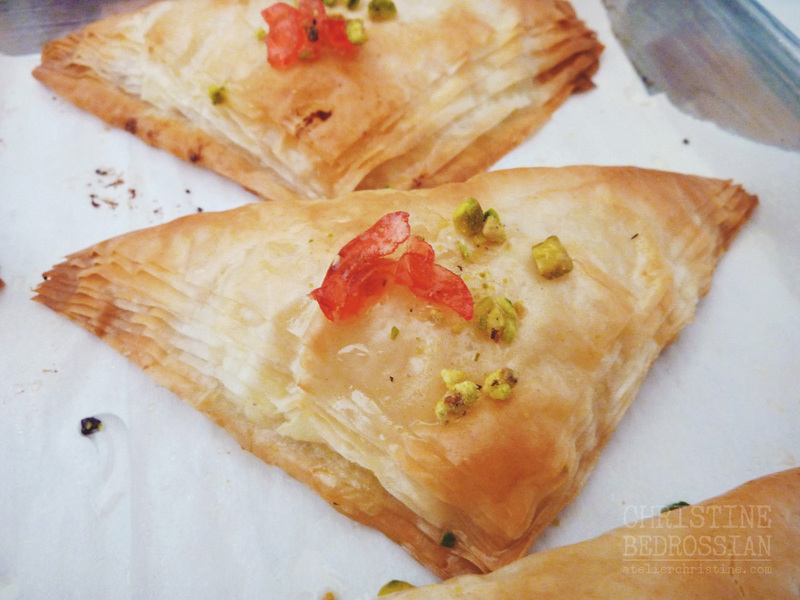 Garnish with pistachios and orange blossom jam.